For over the past year, I have been tracking our net worth each month. Tracking our net worth helps our family stay motivated on our path to financial independence. It allows us to save more and more of our income each month. And it helps keep us investing all that extra income into dividend stocks and low cost index funds. It also helps us stay motivated in paying down our liabilities and keeps us from taking on additional debt. Our first net worth report was published over 3 years ago. It is an awesome feeling to look back and see what our net worth was back then compared to what it is today. Hopefully in another 3 years … we can look back and see similar results. 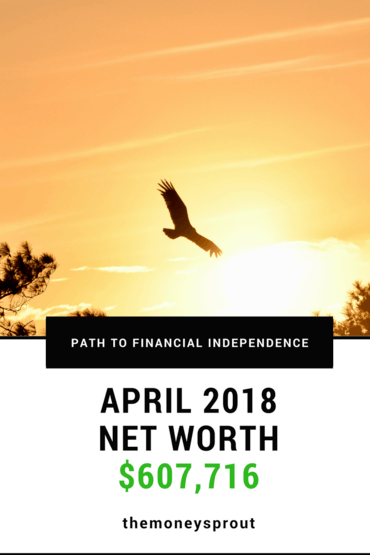 Before we move on to reviewing our April net worth numbers, I would like to mention how we are using our Personal Capital account to do most of the work. So how did we do this April? 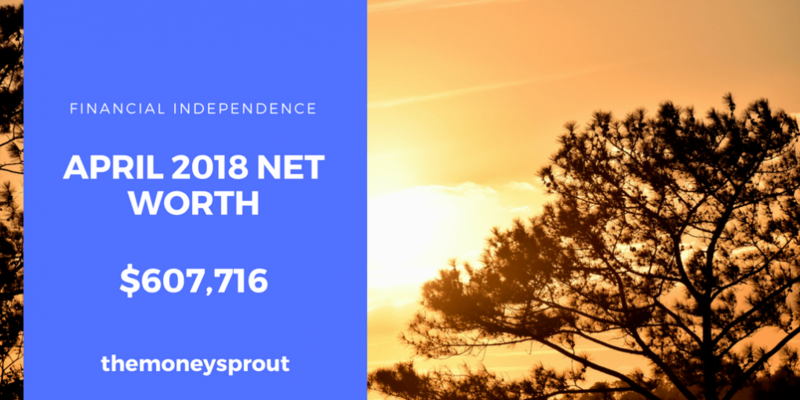 As of April 30th, 2018 – our net worth is $607,716. That is a small decrease of about $400 in net worth compared to last month (March). This decrease is just a slight hiccup along the way on our wealth building journey. We managed to pay down some debt last month … which was a good thing. But our assets dropped … most specifically our cash balance. Last month (March) we got our tax refund back which was reported as an asset. In April we started to move some of that money around into assets and paying off debt. The result was a temporary drop in our net worth for April. Our net worth in April 2018 decreased by a slight 0.07% compared to March. We have been reporting our net worth with 3 main asset categories that include – investments, cash, and home value. The investment category includes our dividend income portfolio, 529 plans for the kids, 457 account, emergency fund accounts, IRA accounts, Roth accounts, and any other retirement account we have opened, etc. It is currently and likely will always be our highest valued asset. There isn’t a day that passes that we are not working to make this asset grow … despite what the overall market is doing. During April, our investments saw a nice little increase compared to last month. Overall, our assets rose by $2,712 in April compared to March. We are slowly starting to pay our $6,000 loan back to ourselves for our son’s braces back in February. Money from our emergency fund was used to pay the orthodontist bill for our son … which dropped our total investments a few months ago. We started paying ourselves back (over 30 months) and it will show up little by little in these net worth reports. As we always like to say each month, the health of our portfolio is still as strong as ever and we are collecting more and more dividend checks each month. We will continue to invest more and more money into the stock market when we have available funds. Our overall cash balance fell by almost $8,000! While this may seem significant, it was just a matter of moving cash into other buckets. We got our tax refund back in March which showed up as cash. A lot of it has been used to invest in new dividend stocks, open a new Roth IRA for my wife, and pay down some of our debt. When it comes to cash … I find it a very inefficient way to build wealth. That is why we put it to good use whenever we can. I have never been a big fan of reporting on our home value in our net worth. Many personal finance blogger’s don’t report their home value. I have gone back and forth on it. But in the end, it is one of our largest assets so I think we need to include it … but I still don’t consider our home an investment. We saw a slight tick up in our estimated home value last month. Our biggest asset class (stocks) rose by almost $3,000 last month, which helped to offset our cash balance decline. In addition, our estimated home value rose by over $1,300 which also helped offset the cash loss. And as I mentioned earlier, our cash balance dropped a lot because of moving funds around into different asset classes and paying off debt. Overall our total assets fell by a small 0.5% since last reporting. The last category is our car loan(s). We are working to pay extra on one of our vehicles and hope to have it paid off by early 2019. The one mistake we made when we bought a home was buying too many square feet. We could have easily raised our 3 kids in a house that was 1,000 less square foot than what we have now. Each month we make a mortgage payment, our principal drops by a little bit more each month. At the start of last year (January 2017), we took on a lot more debt after buying a second car … which I will refer to as “car loan #2”. My 16+ year old vehicle finally died, so I needed reliable transportation. The good news is that we were able to purchase a new vehicle that gets over 35 mpg with a 0% financed loan. The bad news is that we took on $17,000+ in debt and a second car payment. I fully expect to drive this car for 15 years or eventually sell it to my son when he starts to drive. Note – My oldest son just signed up for drivers training this coming summer … so it won’t be long before he starts to drive. This means we need to have a plan in place for how to handle another vehicle … if that is what we decide for him. Since our rate on this vehicle is 1.56%, we haven’t paid too much extra on it. While we are anxious to pay this loan off, we think we could make a higher return from investing the money. We made several pre-payments on this loan late last year, so we don’t need to make an additional payment now until this summer. For now, we are using this extra money to invest since the overall market is down. We want to buy equity assets on sale in the market right now instead of paying off a 1.5% interest loan. Since we didn’t make any payments in April, the balance of car loan #1 remained the same from last month. We will need to start making payments again in June. We did manage to make our car loan #2 payment and saw the balance drop. In total, our car loans pushed our net worth higher by almost $250. Our credit card balances fluctuate a lot month to month. However, this past month we decreased our credit card balance by over $2,500! Now into month 9 of our credit card journey, we have started working on card #10 … and will have earned over $10,000 in future free travel! Since last reporting, our mortgage balance dropped a little – as expected. We also saw a nice dip in car loan debt – which was also expected. Our credit card balances decreased by a bunch too. Collectively our total liabilities decreased by $3,271. That certainly isn’t a ton … but it is still a move in the right direction and will go towards growing our overall net worth. Remember … growing your net worth is not just about increasing your assets. It is just as important to lower your liabilities at the same time. Note – For the first time since taking out our car loan #2 we saw our liabilities drop below $200,000. For us, this is a huge milestone and hopefully will help motivate us to keep paying down that debt. As promised … we plan to keep these net worth posts updated every month now. Not only does it keep us accountable in how we save, earn, and invest … it is great motivation when you see growth like we have over the past 3 years. For example, our first ever net worth report was posted back in March 2015 … 3 years ago. We reported a net worth of $434,984 back then. In 3+ years time, we have managed to grow our net worth by over $170,000. We should be able to conservatively cross the 7-figure net worth well within the next decade … hopefully much sooner. Even with market uncertainty, we will continue to pump in new money each month into the market while we work to pay down our debt. Focusing on both sides of the net worth equation should help us push past $1,000,000 and then on closer to our actually FI Number … which is somewhere between $1.0 million to $1.5 million. I really enjoy looking back at our old numbers (like our March 2015 net worth totals) as it helps keep us motivated and show us tangible results of our work. Do you track your net worth? How was your March totals? What steps are you taking to widen the gap between your assets and liabilities?